Back in November author Lois Winston decided to give me a facelift. No, she didn’t surgically remove all those wrinkles and worry lines I’ve accumulated thanks to all the murder and mayhem she’s subjected me to. If only, right? Instead she decided to update a few of my covers. She began with Assault With a Deadly Glue Gun and Death By Killer Mop Doll, the first two books in the Anastasia Pollack Crafting Mysteries. Click here to see the blog post where we unveiled the results. Next, Lois tweaked the cover of Decoupage Can Be Deadly, the fourth book in the series. Check that one out here. Lois recently turned her attention to the three Anastasia Pollack Crafting Mini-Mysteries, creating new covers to better brand them as a series. Over the next few weeks I’m going to share the new covers with you. 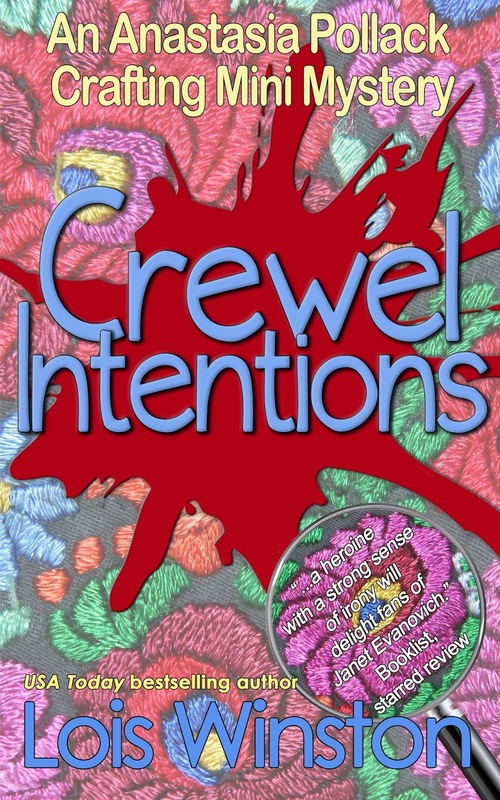 First up is Crewel Intentions, the first mini-mystery. In this novella I receive a desperate phone call from former American Woman fashion editor Erica Milano. Erica played a decisive role in Assault With a Deadly Glue Gun. She’s now in Witness Protection and living under a new identity in Western Pennsylvania. But someone is stalking her, and she has compelling reasons why she can’t go to the police or notify her Witsec handlers. She’s convinced I’m the only person she can trust to help her, and she knows I won’t let her down. After all, she once saved my life. How can I not return the favor? But will I be able to unmask the stalker before he strikes? Find out in Crewel Intentions. Anastasia, you've been keeping Lois very busy (smile!). You are a fount of knowledge and I love the new covers.